NOTE: My group has arrived and we will be going through the park starting this morning. Posts will be limited for the next week due to internet access and time. I’ve been in the park three days and no wolves. 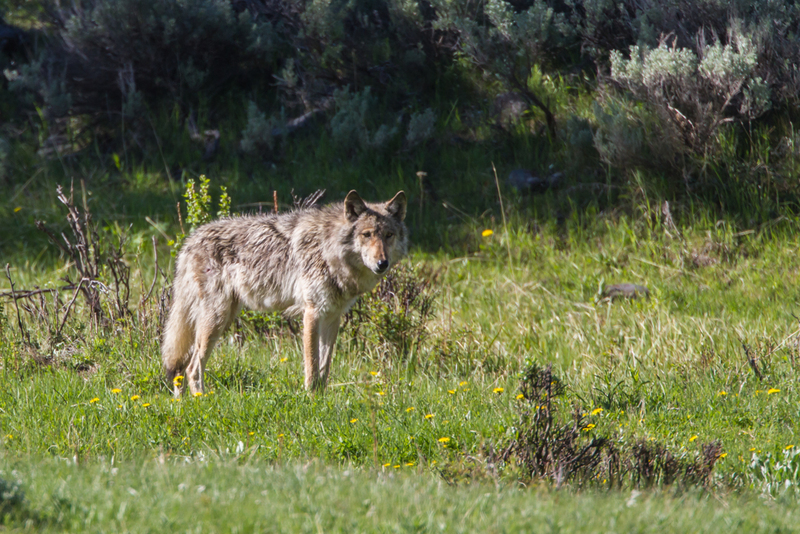 I know several “Yellowstone wolves” were legally killed in lands outside the park by hunters this past winter. I had read this may have disrupted pack structure in the northern range where many of the wolves in Yellowstone spend much of their time. So, it was not too surprising I had seen fewer than in past years. I also tend to not stop at the really large wolf-watching crowds (sometimes there can be 50-100 people at pullouts if a wolf has been spotted) so I probably missed a few opportunities. And then, when you least suspect it – a wolf! I was near one of the hot spots for seeing wolves but there were uncharacteristically no cars. I had seen lots of the usual wolf watcher cars a few miles back at another hot spot. Suddenly, a wolf came into the road in front of me and another car. I grabbed a couple of quick shots (these are the only images in this post that are not cropped) through the windshield and through the open window on the passenger side as it ran across and thought that was it. I backed into the adjacent pullout and the three car loads of people present watched it run out of sight over the hill. One car left and three people from the other car walked up on a knoll to see if they could see the wolf off in the distance. I looked over, and one of the women on the knoll was waving for me to come out, so I started walking over. She waved emphatically, so I ran! I got there and they said the wolf had been just below them on a sand bar in the creek when they got to the knoll, so the wolf had apparently slowed to a walk when it got over the hill. Rules in the park state that you can be no closer than 100 yards to a wolf, so we stayed put and let it walk downstream away from us. The sun was coming in and out of the clouds so I was shooting as fast as I could and trying to keep up with the changing light. But I also wanted to just watch the wolf, seemingly unconcerned that we were anywhere in the vicinity save for an occasional glance our way. It is such a rarity to see a wolf without a crowd around you. Our wolf was sniffing and checking out the area and then seemed to detect something of interest and slowly moved toward it. 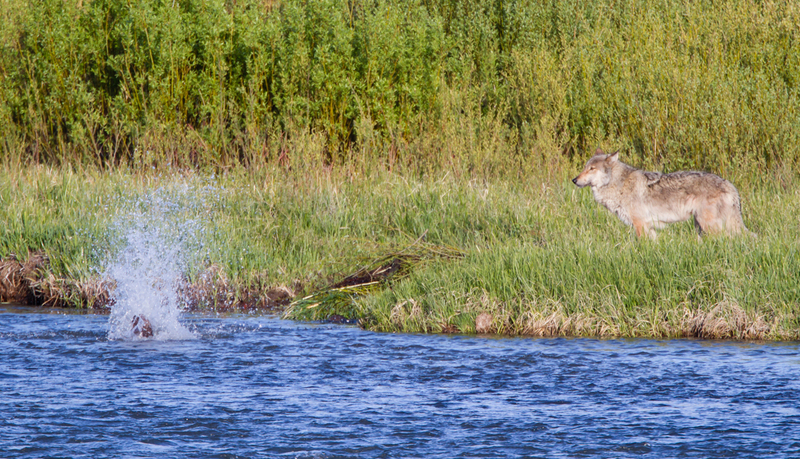 There was a big splash in the water a few feet from the wolf – a beaver! Beaver have been making a comeback in the park in recent years and this was near one of three small lodges I had seen on this trip. 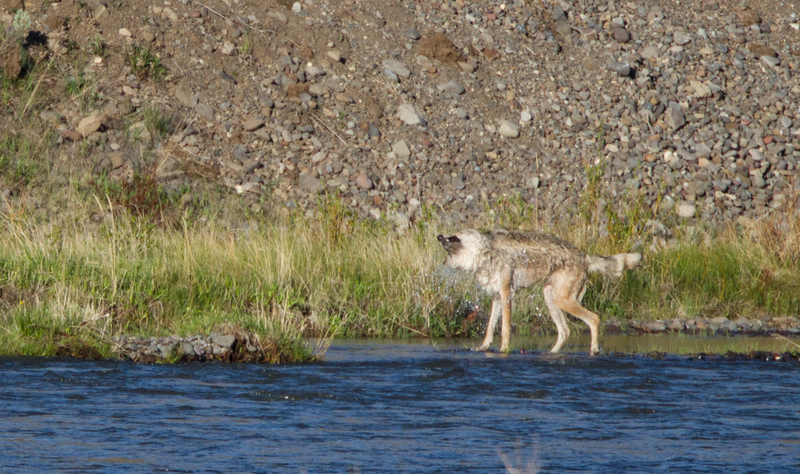 Missing that opportunity, the wolf moved downstream a bit and then swam across, apparently having a tough time at one point in the strong current. It then shook off, climbed a steep bank, and headed back upstream. I went back to the car and headed up the road to where I knew there was another pullout. As I approached, there were already a lot of cars so I went to the next spot down the road with just a few others. These people were watching a different wolf – a black one. 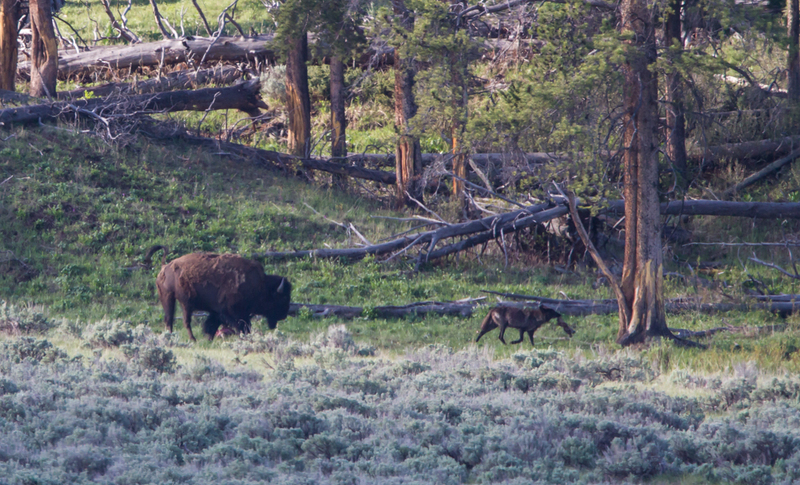 It was feeding on a carcass of some sort (some thought elk calf, some thought bison calf) but was interrupted by an adult bison that didn’t care for the wolf’s presence. The bison kept chasing off the wolf, but the wolf finally got a section of the carcass and ran a short distance and began to feed again. 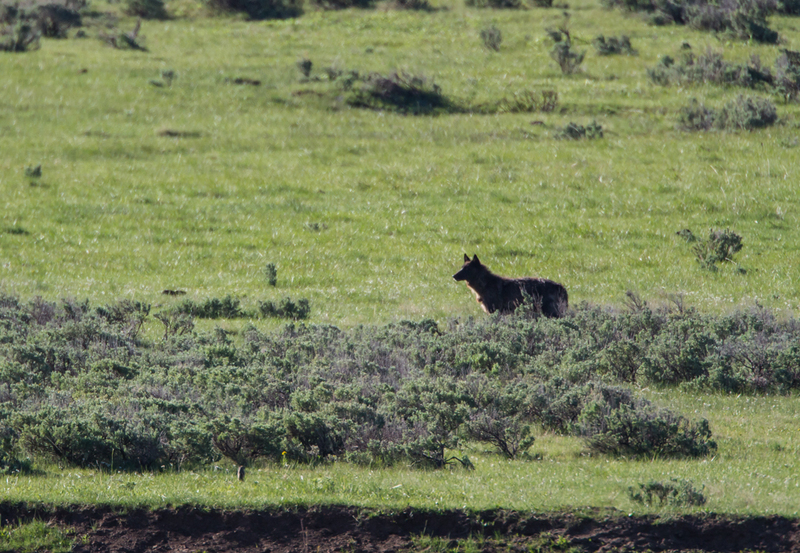 The black wolf then departed, probably taking some food in its belly for pups in the den that is known to be nearby. While all this was going on, a female Pronghorn chased away a Coyote from the same area (she must have had a fawn out there), a Sandhill Crane walked through the scene, our wolf could be seen downstream, and someone pointed out two grizzlies high on a meadow across the valley. So much to see, so little time. Finally, both wolves disappeared from view and the crowds started to leave. As I headed back to Roosevelt for a long overdue breakfast there was another group of cars lining the road a couple of miles from the scene of the wolf sightings. I stopped and found out a wolf was lying across the river in a small depression but was not visible at the moment. This time I did join the crowd to see if it was the same wolf that we had watched earlier. When it stood up, I recognized it as “our” wolf from the creek. 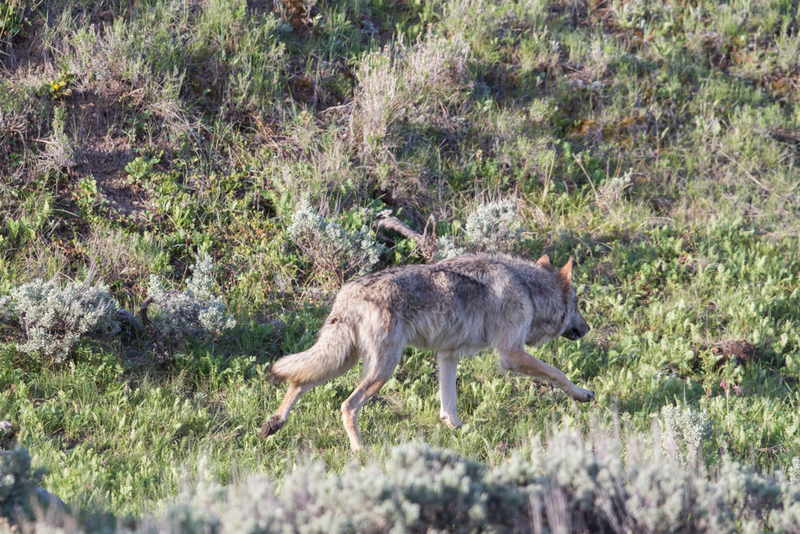 This is the wolf known as Middle Gray by the Wolf Project observers. I believe she is part of the Lamar Canyon pack although the use of that pack name is in question since the alpha female was killed during hunting season last winter and the alpha male left the main group afterward. The black female I saw feeding on the carcass is in the same group of three wolves as Middle Gray. The group apparently has a den site near where they were seen but I have not heard any details on the pups as yet. I hope we are as lucky in the next few days. 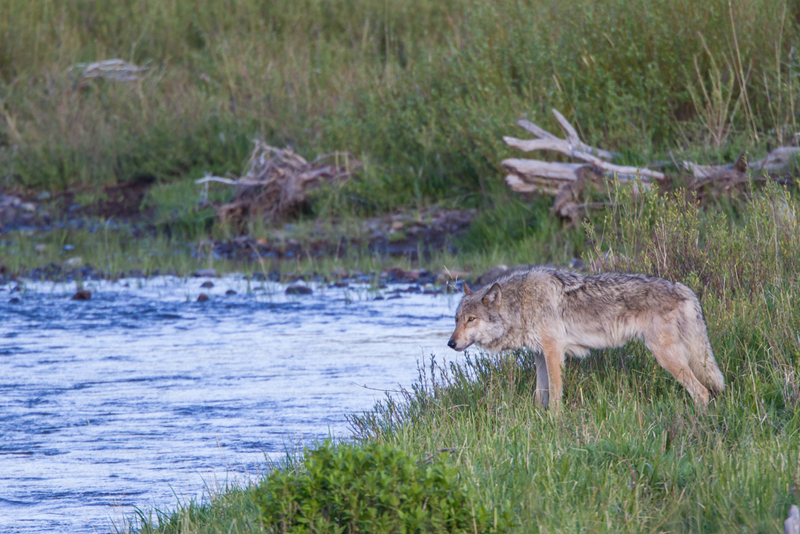 Any sighting of a wolf in the wild is dramatic, but one where you are with only a few other interested observers, and you are able to watch the wolf be a wolf is a rare treat. The issue of wolf hunting is quite controversial. I hope a way can be found to provide a buffer zone around Yellowstone and Grand Teton National Parks so these animals that thousands of park visitors come to see have a better chance of surviving another winter. 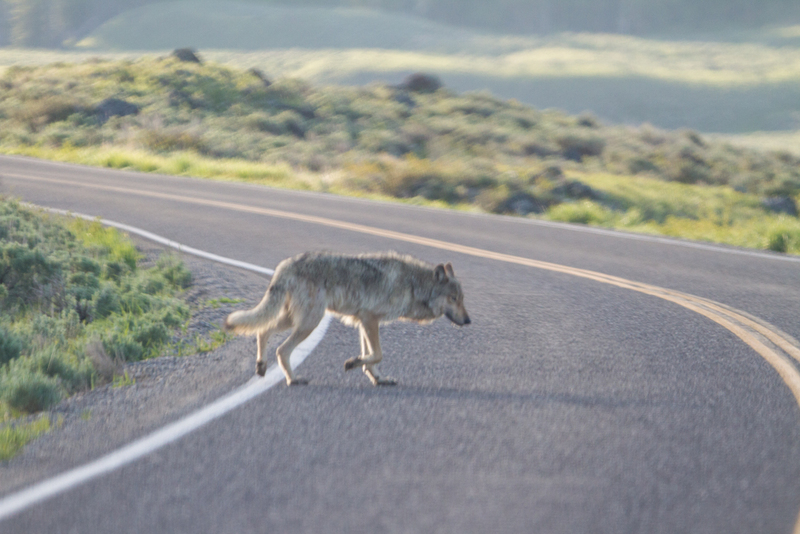 This entry was posted in Natural History, Nature Photography, Trip report and tagged wolf, Yellowstone by roadsendnaturalist. Bookmark the permalink. Thank you! I may never get to Yellowstone, but your pictures are the next best thing. I am grateful that there a few places left where a wolf can be at home in the wild. Great to see these photos have come out so well! It was a pleasure to share these moments with you ( big thanks for letting us look through your telescope!) We are returning to England with some wonderful memories of an incredible place. Mike – I enjoyed your story of how we watched the wolves that morning. I was the woman driving the car in front of you when Middle Gray ran into the road and who was emphatically waving to you at the hitching post pull-out. I am grateful we were able to watch Middle Gray meander along the river bank and watch her encounter the beaver with just a few of us there to witness it. It made for several special, intimate moments between us and her. I also enjoyed meeting you and am so glad you got such great photographs of these special wolves. It was great sharing such a special moment with a special group. And Cindy, thanks for waving me out towards the river. I hope to post some more blogs when I get back. And I hope to see you all again in my favorite place in the future.